What should you do with your Christmas Tree after the holidays are over? Christmas trees don’t belong in your alley; let them have a second life as mulch in our gardens! The Northcenter Neighborhood Association is working to keep trees from taking up space in landfills, and you can help. This is the best option! Remove your ornaments, lights, and garland and bring your tree to any of the City of Chicago drop-off spots. The location closest to Northcenter is Clark Park at 3400 N. Rockwell. Click here for more information about the City’s recycling program. The City will accept your tree from January 3rd through the 17th. Northcenter Town Square, 4100 N. Damen Ave. Trees can be dropped off from 9am - 4pm on January 7th and 14th. 1. We are not a City lot - we are your neighbors who are hauling your trees to the City recycling spots. If you have your tree on your car, PLEASE take it all the way to the City lot at Clark Park. 3. If these rules aren't followed, it jeopardizes the future of the program. Already recycled your own tree, have an artificial tree, or don’t even have a tree, but hate to see our alleys littered with trees in January? Help NNA recycle them! 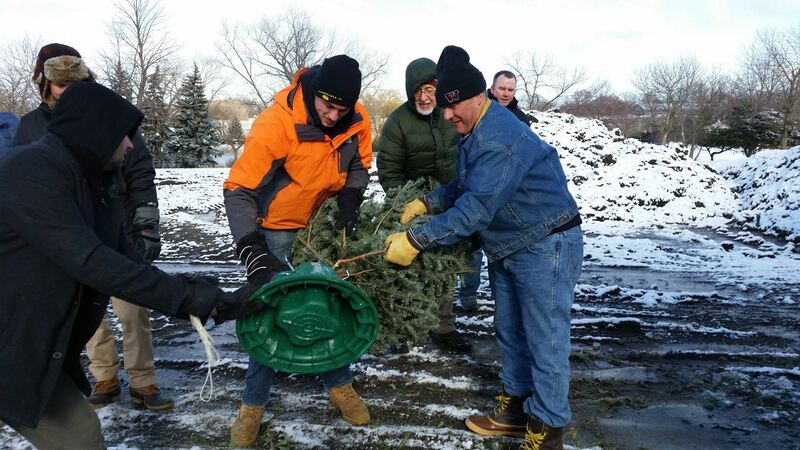 We are looking for volunteers to accept and haul trees on January 7th and 14th. You don’t need to be strong, just willing to give a couple hours to help save hundreds of trees from the landfills.